There are times in life when you have the sense that you are part of something far greater than yourself; that a particular moment reveals itself to be a meeting point with eternity. They are the moments when the Incarnation is experienced not as a theoretical concept, but rather as a fact in history. God and man--God and me--meet in an undeniable and unmerited encounter. The photograph above is a moment like that. 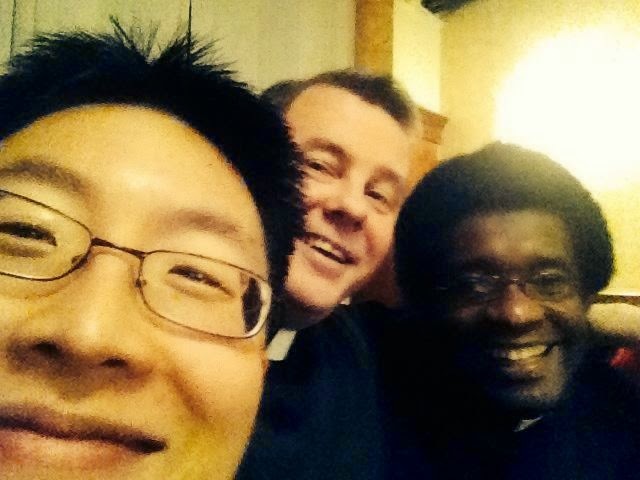 The two men pictured with me are priests with whom I lived at one time. One was a transitional deacon at the time and the other was a priest who served with me. I once joked that the three of us should have dressed up as the Three Kings, taken a picture of ourselves, and mailed it as the parish Christmas Card. So, while not dressed as the Three Kings, we still snapped a photo of ourselves tonight as we joined some of our former parishioners for a Christmas party. All of us together in that room recognize through the friendship that we live together, the Word dwells among us. The Church--like the Blessed Virgin Mary--is a place where mortals encounter the Divine Presence. In the friendship of the Church, Christ enters into our midst, walks among us, and reveals to us the consoling truth that God is with us. These moments come through the sheer gratuity of God's mercy. They come like the Angel Gabriel. They arrive where we least expect. Gabriel came to Nazareth. He came to a poor woman with no societal standing. It was with surprise that the Word entered into human history and saved it. In an age when we are tempted to rely too heavily upon our own ingenuity and planning to build the Church, we need instead to be more like the Virgin Mary; simply open to being surprised by God and receptive to His Presence. This is how the Church grows and draws others into its embrace. When I think about my life as a priest, I realize that what has been most fruitful in my pastoral life has not been my particular talents or ideas. What has been most fruitful has been the times when I have yielded to the surprise of the encounter with Christ in the friendship of the Church. This surprise is lived with brother priests, seminarians, deacons, religious, and lay men and women. It is lived with people twice my age and half of my age. These moments are marked with profound simplicity and with a deep and abiding joy. We don't create them. They are moments when we realize that God has entered into our history and is taking us up into His eternity. When the Angel Gabriel announced to Mary that she would become the Mother of the Redeemer, she pondered and asked, "How can this be?" This question is not a question of doubt. It is the question of one who stands before the Mystery of the Incarnation? How can it be that God draws so close to us? How can it be that God has entered into our life through this particular moment? How can it be that God allows us to encounter His Presence? How can it be? Mary teaches us how to live as a Church of Encounter. In front of the great Mystery of the Incarnation, Mary acknowledges her wonderment. God does not look upon our success and grant it growth. He looks upon the lowliness of his servants. He looks upon our virginal incapacity. He looks upon us with mercy and gratuitously grants fecundity to those who are willing to say, "Yes," to his offer of surprise. To be fruitful priests and fruitful parishes, we must be people who are capable of being surprised and moved by the friendship of the Church. Sterility comes when we try to create the Church. Fecundity comes when we are open to and surprised by God's gratuitous initiatives in our lives. And, these gratuitous initiatives often appear to lack an immediate quality of grand success. Instead, they are like a little backwater town called Nazareth where the Word became Flesh. For me, these moments of encounter come sitting at lunch with a young person at Boston University and talking about life, receiving a text from one of them that cracks me up, sitting around a dinner table tonight with friends whom Christ has brought together, gathering with brother priests whose example inspire me, and in a thousand other small--seemingly insignificant moments. These are Nazareth moments. These Nazareth moments introduce something new into the world. These moments are where the encounter takes place: the encounter between God and man. For some, the photo above are of three people whom they have never met. So, to them it means very little. But, for others who do know the three guys pictured above, they will immediately experience the joy of the encounter. They saw the friendship that we lived together--a friendship gratuitously given by God--a friendship that moved us and caused us wonderment and joy. Not only did others see this friendship, they lived it too. When we live as a Church of encounter, others are drawn in. It is never exclusionary or stagnant. This is the Church. It is to live the Incarnation. It never grows old. It is always new. It is to wake up each day even more ready to be surprised, convinced, and moved by a fact: The Word Became Flesh and Dwells Among Us.